A Windows Mixed Reality head mounted display (HMD). A new Windows Mixed Reality ready PC or a Windows Mixed Reality compatible PC running Windows 10 Version 1709 or later. 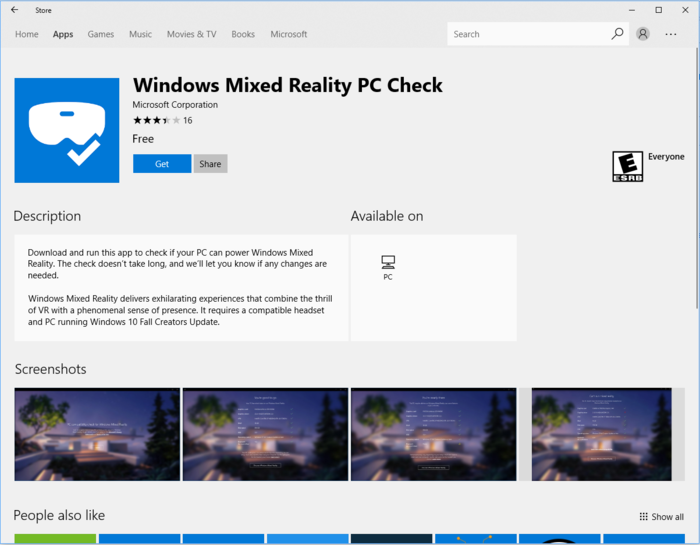 Download and run the app: Launch the Windows Store from your Desktop, search for the Mixed Reality PC Check App and click Get to download and install it. You can also follow this link to launch the correct Store page. 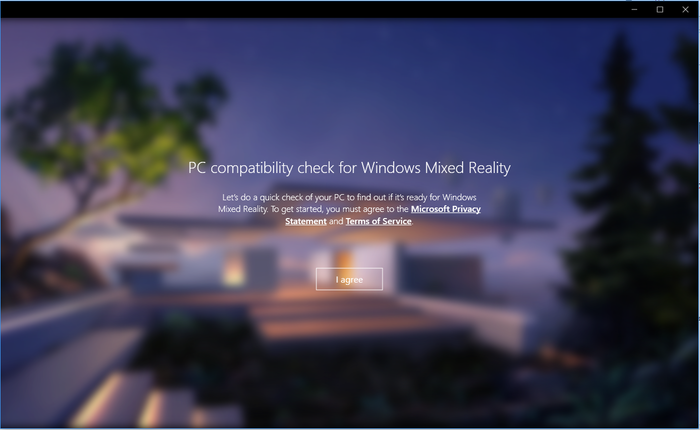 On Windows 10 PCs with at least Windows 10 Version 1607 (Anniversary Update), this application can check your hardware and software to determine whether the device can support Windows Mixed Reality in its current state. After the app has installed to run the app. After reading the terms and conditions, press I agree to accept. See if your PC is compatible with Windows Mixed Reality: You should get results that look similar to the image below. If all checks are green, you're good to go! Orange triangles mean that your mixed reality experience may be sub-optimal. Red X's mean that your PC does not meet the minimum requirements to run Windows Mixed Reality. For more information on troubleshooting issues with PC Compatibility go here. To see which version of Windows 10 your device is currently running, select the Start button, then select Settings > System > About. To ensure that Windows 10 is up to date on your PC, select the Start button, then select Settings > Update & security > Windows Update. Select Check for updates. If updates are available, install them. Your Windows Mixed Reality compatible PC may not have the full-sized HDMI and USB 3.0 ports needed to connect your immersive headset. Or you may need a Bluetooth adapter to meet the PC Check requirements. If that's the case, you'll need adapters to connect your headset and Motion Contollers. You'll find a list of adapter types you may need, and some recommendations on specific adapter models here. Windows Mixed Reality is designed to work best with Windows Mixed Reality Motion Controllers, which provide natural, precise interactions with no need to install hardware on your walls. But you can also use an Xbox controller or a mouse and keyboard. Unless you purchased a Samsung HMD Odyssey headset (which has integrated AKG headphones and an integrated dual-array microphone), you will need to get an audio headset a pair of headphones that can plug into your HMD’s headset's 3.5mm audio jack. If you want to move around while using Windows Mixed Reality you'll need to have a large, open space. During setup you will be asked to choose between "Seated and standing," or "All experiences" and you'll want to chose "All experiences" and set up a boundary if you want to move around. If you select Seated and standing , you'll be using your headset without a boundary. This means you'll need to stay in one spot when using the headset, so that you can avoid physical obstacles and tripping hazards. You can sit down or stand up, but you shouldn't move around. Some apps might be designed to work with a boundary, so you might not be able to use them, or might not have the same experience, if you use them without a boundary. If you choose "All experiences," you'll set up a boundary, and you will be able to move around and use apps and experiences that work with a boundary as well as those that don't require one. You'll need to prepare your space to make sure there are no obstacles, hazards, or fragile items in the area you’ll be using (including above your head). Don’t set up at the top of a staircase or under an extra-low ceiling fan. Remove breakables and obstacles from the area, and make sure that you and anyone who uses your headset reads and understands the safety guidelines.